With its smooth yet bubbly crust and deliciously tangy and chewy interior, it’s hard to pass up a thick slice of lightly toasted homemade sourdough bread with your morning eggs or . . . well, is there a meal that wouldn’t be better with sourdough? 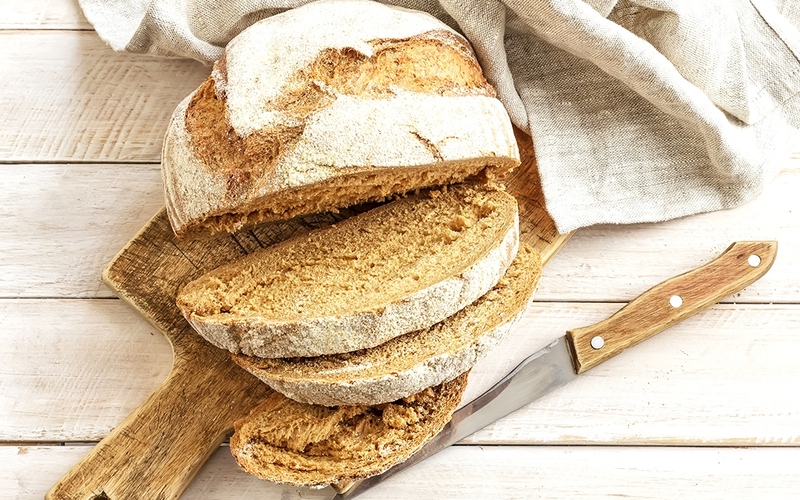 Sourdough has been traced back to ancient Egypt and is likely responsible for the first leavened breads, and the method was enthusiastically continued by European bakers. Other cultures also create breads that taste like sourdough by baking with yogurt, kefir, beer or other fermented ingredients (think Ethiopian injera and the Indian dosa). Sourdough is “sour” because it’s fermented, meaning that “wild” lactobacilli and yeast (naturally occurring in any environment, not just San Francisco) have transformed ordinary flour and water into a fermented starter that will, mixed into a bread or other recipe, create the same rising effect as baker’s yeast. It’s these wild probiotics and yeasts that lend sourdough unique flavor. There are numerous methods for creating the “perfect” sourdough culture. We recommend experimenting with these basic guidelines. The whole process takes about 5 to 7 days. Each day you’ll remove some of the starter and “feed” the rest with fresh flour and water. 1. Combine ¾ cup flour with a little less than ½ cup water. Stir to create a thick, pasty dough. Place dough in a clean glass jar, such as a large mason jar, and cover with plastic wrap (you can use the lid to secure it in place, not too tightly though). Let it sit for about 24 hours at room temperature. 2. Days 2–3: By the second or third day, the dough should have small bubbles on its surface, a sign that the sourdough culture is beginning to grow. It may also start to develop that “sour” smell. Feed the starter with the same amount of flour and water. 3. Day 4: Feed the starter again, following the same instructions as above. 4. Days 5–7: Your starter is ready! 5. Maintain: Starter will keep for a few days on the counter or longer in the fridge. If you refrigerate, remember to remove it and feed your starter with fresh flour and water every week or so. If you get too much starter, simply discard part of it while “feeding” your batch. Sourdough starters can keep indefinitely this way. In fact, the famous Boudin bakery in San Francisco still bakes with its “mother” starter, originally cultured in the late 1800s!